Buffalo sauce, celery sticks, carrots and ranch dressing..it’s a flavor combo the just WORKS! I’m incorporating all of those flavors into these healthy Buffalo Chickpea Veggie Burgers. The burgers are made with chickpeas, oats ( for texture and because they are good for you) shredded carrots, red bell pepper, garlic powder and Franks red-hot sauce ( or your favorite variety). I’m cooking them in a skillet but your could also cook them on a grill or grill pan. And the slaw! 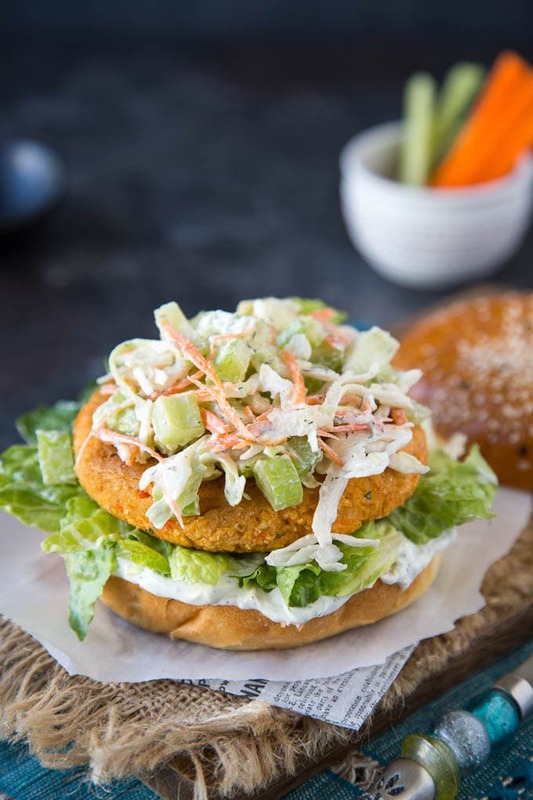 The slaw takes these Buffalo Chickpea Burgers to the WOW zone. 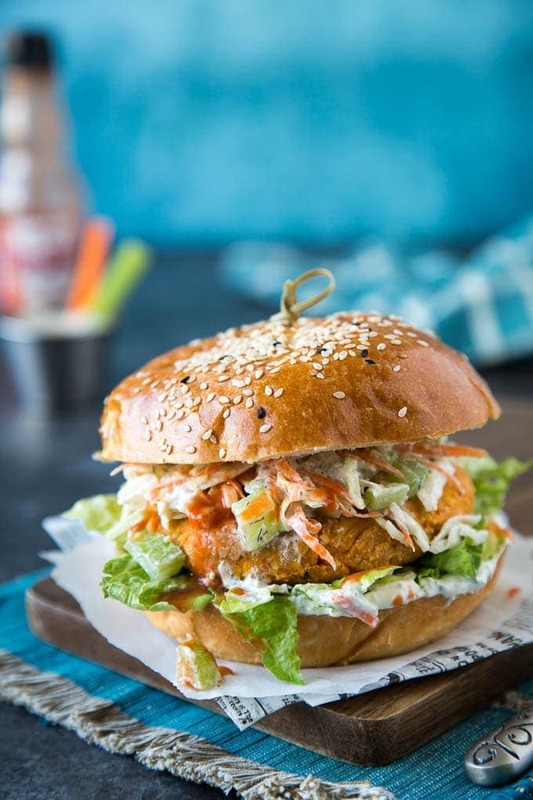 Homemade healthy Ranch Dressing mixed with crunchy cabbage, carrots and celery is the perfect complement to the flavorful buffalo hot sauce in the burgers. Combine a can of chickpeas ( 1 ¾ cups) with 1 ½ cups old-fashioned rolled oats, parsley and garlic powder to a food processor or blender. Pulse until the ingredients are mixed. Recipe Notes: Make sure to use old-fashioned oats not the quick cooking/instant oats for a better texture. Add shredded carrots, bell pepper, hot sauce ( like Franks Red Hot brand) , egg, salt and pepper to the chickpea mixture and pulse to mix ingredients together. Form mixture into 4 patties. Cover and refrigerate the patties while you make the slaw. This helps the burgers to firm up and stay together when cooking. Recipe Notes: You’ll want the chickpea mixture to be chopped but not mushy/wet/paste-like. Patties can be made ahead of time and kept in the refrigerator ( up to 24 hrs.) before cooking. Combine the cole slaw mix and celery in a medium bowl. In a small bowl mix together the Ranch Dressing ingredients. Add 1-2 Tbsp ( more or less to taste) of the Ranch Dressing to the cole slaw mix. Recipe Notes: You can substitute 1-2 Tbsp or your favorite prepared Ranch Dressing or Blue Cheese dressing to keep things even easier if you prefer. Add olive oil ( or avocado oil) to a large skillet over medium heat. When hot add the burgers and cook for 3-4 minutes on each side until the burgers are golden brown on each side. Serve burgers on your favorite hamburger bun/artisan roll and pile high with crisp Ranch Slaw. For a lower carb option cut the burger in half and serve with the slaw in lettuce wraps . Dont forget the extra drizzle of hot sauce/ranch dressing. Recipe Notes: Refrigerating the patties for a few minutes ( and up to 24 hrs) will help them stay together while cooking. If you’re planning on cooking on a grill you’ll want to let the patties chill out in the refrigerator for a few hours before cooking. Hamburger buns, lettuce and any other burger fixings you desire. Also great served with carrot/celery sticks( for dipping in extra Ranch dressing). Combine chickpeas, oats, parsley, and garlic powder in a food processor or blender and pulse until well combined. Mixture should look chopped but not mushy/wet/paste-like. Add shredded carrots, red bell pepper, hot sauce, egg, salt and pepper to the food processor/blender and pulse to combine. Mixture should look chopped but not mushy/wet/paste-like. Form ¼ of the chickpea mixture into a ball and then flatten with thumbs to create a burger patty. Repeat until all 4 burgers have been formed. Cover and refrigerate the burgers while making the Ranch dressing and slaw. This helps the burgers to firm up and helps them stay together when cooked. Combine cole slaw mix and celery in a medium bowl. In a small bowl mix together ingredients for the Ranch dressing. Add 1-2Tbsp Ranch dressing to the cole slaw mix and mix thoroughly. You will have extra Ranch dressing to put on the burger if desired (or to dip carrot sticks/celery sticks) . Heat a tablespoon of olive oil/avocado oil in a large skillet ( or use non-stick spray) over medium-high heat. When hot, add burgers and let cook for 3-4 minutes or until burgers become golden brown. Flip over and repeat. 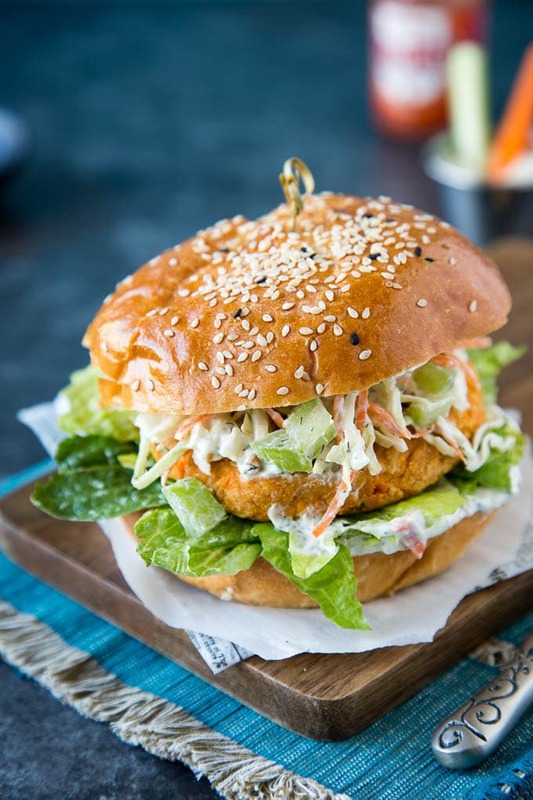 Serve on hamburger buns with extra ranch dressing topped with Ranch slaw mixture. Or for a lower carb option serve over a bed of lettuce with extra ranch dressing.